The Last Airbender (Jin, Zuko, and Iroh). Zuko drinks tsaa from Jin.. HD Wallpaper and background images in the Awatara - ang Huling Airbender club tagged: zuko iroh jin. Zuko drinks tsaa from Jin. This Awatara - ang Huling Airbender fan art might contain anime, comic book, manga, and cartoon. oh my gawsh zuko is hilarious.... I'M TURNING INTO YOU!!! haha. priceless. wouldn't miss it for anything. 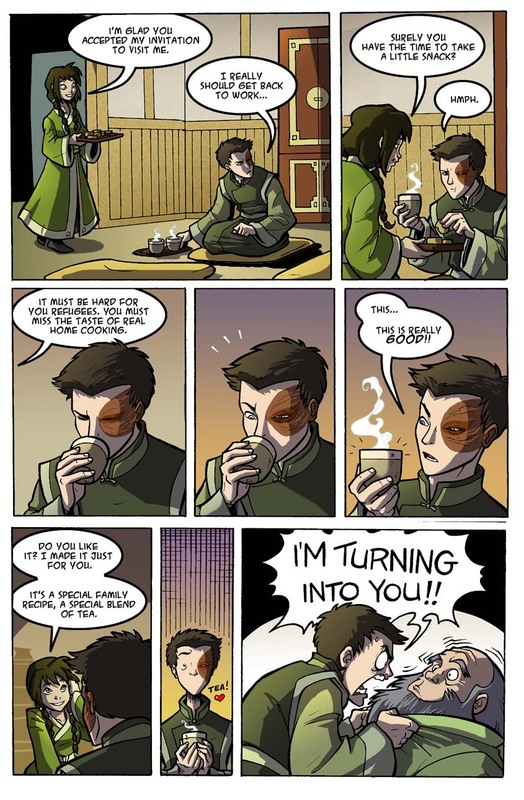 :3 i do notice that in the episodes, it shows that zuko himself is terrible at making tea..
Yep...in Book 2 ~episode 9 'Bitterwork', Zuko was seen making tea for his uncle. Iroh has a WTFlip expression! read atla comic book full free " awatara pag-ibig potion #8 "